Be the first to share your favorite memory, photo or story of Stevon. This memorial page is dedicated for family, friends and future generations to celebrate the life of their loved one. 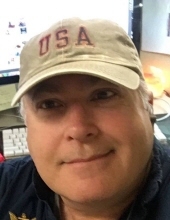 Stevon Duane Warner, 59, of Pittsboro, North Carolina, passed away on Wednesday, January 30, 2019 in Pittsboro. He was born in Delaware, OH on November 12, 1959. Stevon was a graphic artist in computer design and enjoyed being a ceramic artist. He was also a veteran of the US Navy. He is survived by his mother, Dolly (Bowers) Wisma; his sisters, Sharon (Brian) Williams, Susan Warner; his life partner of 15 years, Laura Edelen and her children John (Kate) Edelen and Stephanie (Richard) Dorre and 5 grandchildren; first cousins Charles Zeilman of Florida, Lincoln Zeilman of Colorado and Lucy Merges of New Knoxville, OH; and numerous nieces and nephews. He is preceded in death by his father, Elwyn Warner, and his step-father Richard Wisma. Family will receive friends from 1-2 p.m. on Saturday, February 9, 2019 in the WALTER & LEWIS FUNERAL HOME, 642 S. Main St, Urbana, OH, where a memorial service will be held at 2 p.m. with Pastor Roy Yocom officiating. To send flowers or a remembrance gift to the family of Stevon Duane Warner, please visit our Tribute Store. "Email Address" would like to share the life celebration of Stevon Duane Warner. Click on the "link" to go to share a favorite memory or leave a condolence message for the family.